Is Death really necessary is a science fiction novel by Judi Moore. It's the year 2038 and the potential of Nanites are finally being realised, with the power to heal the terminally ill quickly and safely the technology could be seen to be a breakthrough in humanities ever elusive quest for immortality. As with any form of technology, Nanotechnology also has the potential to be exploited for destructive ends though and it only takes the misguided act of a brilliant mind to turn the world's supply of Petrol into a useless goo. 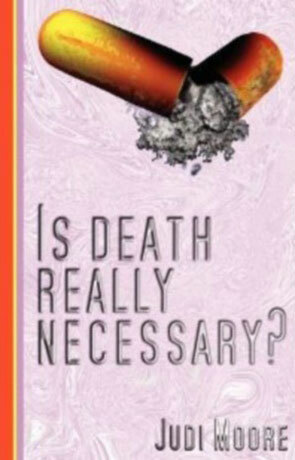 I was quite unprepared for this book, going by the title and the opening chapters you could assume you are going to read a book about mortality and while that is one of the themes explored here it's just one among others. Environmentalism takes center stage for much of the story and the novel manages to highlight our reliance on that black gold - even today wars are being fought over this ever dwindling reserve. The future vision painted by the author here doesn't feel that far removed from our own, and for the most part comes across as very conceivable although I would have hoped that by 2038 we may have escaped at least in some forms our over-reliance on fossil fuels. This vision does however not only highlight the issue of fossil fuel dependence but also considers the future of technological control, who would supervise the use of this technology and exactly how would they control it. Is Nanotech just a new powerful tool to be kept out of the grasp of Terrorists? or does it's use itself provide a danger that could wipe out humanity. The story itself is entertaining and the characters believable, but the main protagonists are the only ones that feel really fleshed out, the smaller characters do seem a little two dimensional. The plot is fairly well balanced and the pace fast enough to keep the interest going and there is a nice dark and quite subtle humour running through-out. The technical aspects are also sufficiently described to be believable but without descending into that pace destroying techno-babble that is such an easy trap to fall into. The first few chapters are quite dark though and not very cheerful but this is of course expected and needed, dealing as it does with death and critical illness, although I did find that the plight of the principal protagonist was a little overplayed during that stage of the story. The author's voice shows a maturity and intelligence that remains consistent throughout the novel and leads to a strong and rewarding ending. The more I read Is Death Really Necessary the more I found myself enjoying it, there are a number of genuine suprises both from the plot and the characters themselves and this really does raise the level of suspense, I found myself thinking "i'll just read one more page" long past the time I was going to stop reading for the evening and that in itself doesn't happen very often. A fresh perspective and intelligent dialog on the use of technology, the effect on environment and the control over mortality, recommended. Written on 30th April 2011 by Ant.